The reversing valve is the most complicated valve we use in the HVAC industry. It reverses the flow of refrigerant in the system to make the condenser into an evaporator and the evaporator into a condenser. These valves use the system pressure difference between high side and low side to move the slide in the valve to the 2 different positions. It is a pilot operated valve that uses a small slide to direct refrigerant pressure to either side of the valve end caps, putting low pressure on one side and high pressure on the other to move the piston into position. The pilot slide is at the bottom of the picture below and is actuated by an electric solenoid that is slid onto the shaft. The video below gives a look inside so you can see how it works. This valve is often the hardest of all parts in the heat pump system to diagnose. They can fail 2 ways. They can stick in either the heat or cool position. This is fairly easy to diagnose. Start the unit and let the pressures settle to normal. Check if the solenoid will energize. If it energizes and the valve won't move, it is stuck. If the solenoid won't energize, you have an electrical problem and the valve is ok. The harder one is a valve that is stuck partway so the slide is not fully in either position. This is the tough one. When the valve is in this position, the symptoms may be quite hard to understand. You could have low head pressure and high suction pressure. When shut down, the unit will equalize pressures very quickly. These are the same symptoms as an inefficient compressor with failing valves. If the compressor valves are failing, there will often not be enough pressure difference to allow the valve to actuate and move fully into position. Sometimes you may have a very high head pressure and also high suction pressure. It just depends on what position the valve is stuck in. The use of temperature probes on the lines may help to understand what is happening. The answer often is to replace both the valve and the compressor as either failure has probably damaged the other. 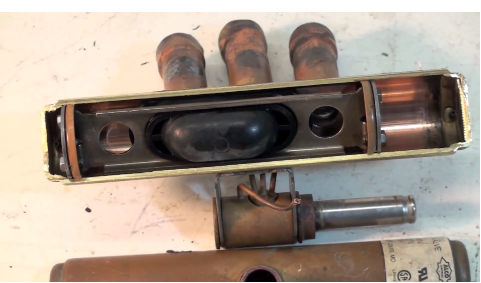 Below is a video that shows a failed valve diagnosis. This valve is stuck part way. The above valve was removed and disassembled. The video below looks at the inside.